One in six Americans--about 53 million people--have a physical disability, and at least 2.2 million use a wheelchair. Disabilities involving visual, hearing, and sensory impairments are widespread. Over the past two decades, our understanding and diagnosis of disabilities has advanced tremendously. At the same time, new technologies have led to implants and devices that help alleviate many obstacles to daily living for the people who need them the most. Today, we are focusing on the next chapter: medical rehabilitation, the shift from the hospital to the home, where patients become participants in their own recovery. Our National Center for Medical Rehabilitation Research (NCMRR) has launched an ambitious plan to energize, advance, and refocus this research field. Dr. Alison Cernich, who became the NCMRR Director last year, is leading the effort, with the support and partnership of 16 institutes and centers within the National Institutes of Health (NIH). Earlier this year, NIH held a conference and town hall meeting to gather input and feedback on the plan: Rehabilitation Research at NIH: Moving the Field Forward. As Dr. Cernich noted at the conference, exciting technologies currently exist, but the challenge is adapting the technology to work in the home so that people can maintain and improve on the gains they achieve in rehab hospitals. Facilitating further recovery at home is a key area that needs our attention. Some people are better able to adapt and recover after injury, while others require more rigorous rehabilitation. We need a better understanding of how biology, physiology, chemistry, and genetics affect recovery, so that we can improve prognosis and therapy. We also know very little about the progression of disabilities as we age, and that may affect the way we bring treatments to the home. We do know that 60 percent of Americans over age 65 have a basic disability. Perhaps there are transition points that would require us to alter treatments, whether that transition is from childhood to young adulthood or from adulthood to the elderly years. "When your science directly improves people's everyday lives, that's compelling research." One scientist in the rehabilitation research field is James Rimmer, Ph.D., director of the Lakeshore Foundation/University of Alabama-Birmingham Research Collaborative. As a youngster growing up in a public housing project in New York City, playing sports usually revolved around pick-up basketball games at a nearby park, where kids with disabilities--emotional, physical, or otherwise--were often left out. Rimmer, a former member of the NCMRR advisory board, has spent a lifetime trying to help children and adults get back in the game. In a study he plans to launch later this year, Rimmer will enroll 600 participants with physical disabilities to evaluate a telehealth rehabilitation model over 48 weeks. 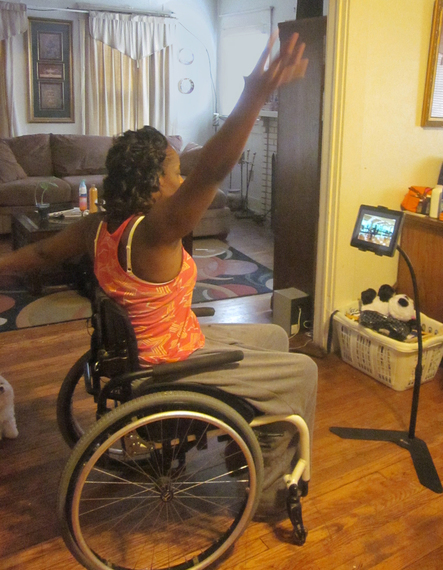 Participants will use technology to assist in their rehabilitation at home, including videos and music to help stimulate movement. Throughout the study, Rimmer's team will take a battery of biomedical measures, including heart, muscle, and brain function. The researchers also will monitor in real time the frequency and duration of participants' physical activity. Rimmer is exploring the concept that cognitive changes occur through movement. "We all have limitations of some sort and that's okay, but how you empower yourself to become physically active within those limitations, how you maintain that at home, that's a story we want to tell," he said.